REMOVAL OF CARPET, TILE, HARDWOOD FLOORS & MORE! Did you know that almost one pound of dust is created per square foot when removing flooring? If you are replacing your home or office’s floors, you know how messy—and dusty—it can be. That’s where Speedy Floor Removal in comes in. We serve homes and businesses throughout the Orlando, FL area, such as Apopka, Windermere, Clermont, and more! With our floor removal services in Orlando, you can eliminate the hassle of removing your flooring with our dustless removal process. Whether your home or office needs to remove hardwood flooring, carpet, or tile, our company has the tools and experience to remove your flooring quickly and efficiently. Ready for us to ease your floor replacement project? Call the experts at Speedy Floor Removal today for fast and reliable floor removal service in the Orlando area. When a general contractor breaks up your old flooring, dust is created and then scattered throughout your home. If you or a family member has asthma or allergies, this excessive amount of dust can really impair breathing. With Speedy Floor Removal’s services in the Orlando area, you can eliminate the headache of cleaning dust and focus more on what’s important—installing your brand new floors! We can remove your flooring and leave your home dust free with our special machinery. Our special HEPA (High-Efficiency Particulate Arresting) Certified Air Cleaners remove any particles in the air that are too small for the naked eye to leave your home or office dustless and clean. Speedy Floor Removal works with businesses and homeowners throughout the Orlando and North Central Florida area. We have three floor removal plans that can fit any need and budget. Our most popular package is the Premium Package—this package guarantees no dust and no cleaning. If you are unsure which package is right for you, call one of our experts to discuss which best fits your needs. WHY SERVICE WITH SPEEDY FLOOR REMOVAL? Speedy Removal. 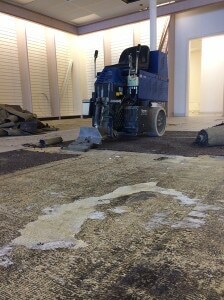 Our machines are fast and safe so we can remove your flooring in just one day! Better Installation. When your flooring installer comes, they will be able to install your flooring more efficiently. No Damage. Our highly skilled professionals are experts at removing carpet, tile, hardwood flooring, and more throughout Orlando. Friendly Service. We care about our customers and their home or business. When you choose us, you can guarantee quality customer service. Winter Park, Sanford, Apopka, Windermere, Lake Buena Vista, Kissimmee, St. Cloud, Clermont, and more!